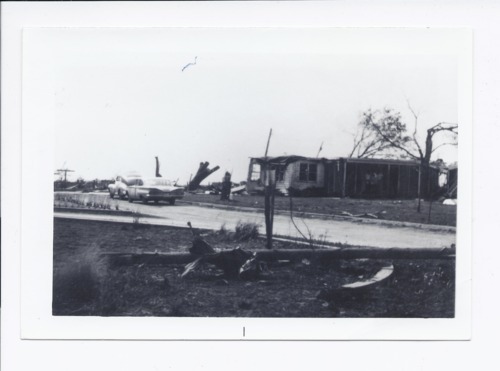 A photograph of the Joe Campbell home after a May 19, 1960 tornado. Either partial or total destruction of seventy-five farms and homes were reported from this storm that happened in the late afternoon. There were no deaths in the area. This photograph is provided through a pilot project to host unique cultural heritage materials from local libraries on Kansas Memory and was accomplished by mutual agreement between the Northeast Kansas Library System, the Rossville Community Library, and the Kansas Historical Society.